Product Description: The Westinghouse iGen 2500 was designed with the recreational user in mind. It even has two USB ports to directly connect personal electronic devices like mobile phones. Using this inverter generator in public outdoor spaces won’t disturb the people nearby since it has a rated noise level of 52 decibels at a 25% load. The casing is designed to be noise canceling and the generator is also fitted with mufflers. Most inverter generators float around the 2000 watts mark for surge power and 1600 – 1800 watts for running power. The Westinghouse iGen 2500 delivers more power in an otherwise similar design and weight category. The Westinghouse iGen 2500 was designed with the recreational user in mind. It even has two USB ports to directly connect personal electronic devices like mobile phones. Using this inverter generator in public outdoor spaces won’t disturb the people nearby since it has a rated noise level of 52 decibels at a 25% load. The casing is designed to be noise canceling and the generator is also fitted with mufflers. Since it is an inverter generator, it produces clean energy and so it is safe to connect to sensitive electronics like laptops and cameras. This model has a Total Harmonic Distortion (THD) of less than 3%. If you are looking for a compact generator with a little extra power then this is a good option. Of course, you can always use the parallel capabilities and join a second Westinghouse iGen 2500 which gives you a total of 5000 watts. 5000 watts is enough to run all the basic home appliances such as an AC, portable heater, kitchen stove and refrigerator. 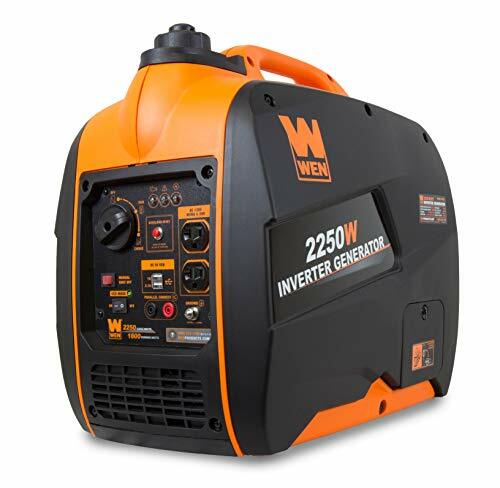 So, if you are looking for a generator that you can also use for emergencies during a power cut then you might want to consider getting two Westinghouse iGen 2500 inverter generators instead of one noisy conventional portable generator. The Westinghouse iGen 2500 has a small tank of just one gallon but it proves energy efficient. It has a decent run time of 7.7 hours at a quarter load and an expected run time of up to 6 hours at a 50% load. The low noise level of the Westinghouse iGen 2500 is impressive at only 52 decibels at a quarter load. For comparison, an average conversation is rated at 60 decibels. As is common for inverter generators, this model also only starts with a manual recoil system. Since portability is one of the main selling points of an inverter generator, installing a battery for an electrical push start means extra weight and so would make the design less portable. Maintenance and monitoring is relatively easy on this model. The most important monitoring features are already automatic; the low fuel shutoff and automatic circuit breaker in case of overloading. The LED screen offers real-time information on the fuel level, voltage, run time and power output. The control panel also includes indicators such as a low fuel warning, overload warning, output ready indicator, fuel level, low oil indicator and electrical output. The big brother of the Westinghouse iGen 2500 is the Westinghouse iPro 2500 model. Where the former is very suitable for recreational use, the latter is designed for industrial use and off-grid work sites. The technical specs of the Westinghouse iPro2500 are very similar to the recreational model. The main difference is in the mechanics and housing which in the Westinghouse iPro 2500 is compliant to the Occupational Safety and Health Administration (OSHA) requirements. This means that the Westinghouse iPro 2500 is more durable and better resistant to shocks. This does not take away from the quality of materials used for the Westinghouse iGen 2500 but there are simply different requirements for professional use generators and personal use generators. Just like the Westinghouse iGen 2500 the work site version is also EPA compliant. In addition, the Westinghouse iPro 2500 is also CARB compliant so free to use in the state of California. 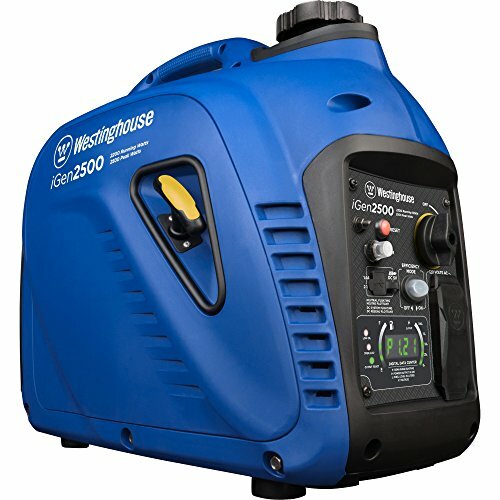 Generally, there is a significant price difference between a recreational generator and a professional work site generator but there is not that much difference between the Westinghouse iGen2500 and the Westinghouse iPro 2500. The main difference is that the Westinghouse iPro 2500 is both CARB and OSHA compliant but in terms of run time, power and energy efficiency these models are the same. So, is it worth the extra money to get the Westinghouse iPro2500? It is more a question of whether the Westinghouse iPro 2500 is sufficient for the specific work site because compared to other work site generator models it is on the lower end of power requirements. For recreational purposes, there is no reason to lay down a little extra when most technical specs are the same. Unless, you live in California, then you need the Westinghouse iPro 2500. In weight and size, the Westinghouse iGen 2500 is comparable to most inverter generators in the 2000 watts category. Which means you get more power in a similar portable design. Another aspect worth comparing is the run time. This says a lot about how fuel efficient the inverter generator is and whether the smaller fuel tank of inverter generators is a disadvantage. The Westinghouse iGen 2500 has a reported run time of 7.7 hours at a 25% load and up to 6 hours at a 50% load. Compared to similar models like the Honda EU2200i or WEN 56225i 2250 watts model, this is an average run time. In terms of portability these models are similar, too. The Westinghouse iGen 2500 weighs just 2 pounds more than the Honda EU2200i which is about the same as the WEN 56225i. There is a reasonable price difference between these models, though. The Westinghouse iGen 2500 sits in between the price points of the Honda EU2200i (most expensive) and the WEN 56225i (least expensive). Another big difference between the Westinghouse iGen 2500 and comparable models is the LED screen and control panel. The Westinghouse iGen 2500 control panel is more extensive than with comparable models which makes this model more user-friendly and easier to maintain. For its price range, the Westinghouse iGen 2500 offers a lot features that are missing from similar inverter generators in the same pricing category. That is what makes this model stand out. The first advantage is in the amount of power it has. The Westinghouse iGen 2500 delivers more power for a very similar price and similar compact portable design. Another great advantage is the LED screen and indicator lights on the control panel. The control panel is clear and easy to follow which makes monitoring the generator a lot easier than models whereby you would have to stop the engine to check all its parts. The quick monitoring from the control panel also serves as a reminder for maintenance. Maintenance should never be overlooked with generators so having the informative control panel makes the Westinghouse iGen 2500 an user-friendly model. There is another advantage related to maintenance; the draining of the oil and fuel tube outside of the housing. Changing the oil and draining the fuel tank are both time consuming maintenance tasks so making the draining easier saves you time and hassle. Finally, we appreciate the USB ports included in the design. This makes charging personal devices like cameras on outdoor trips easier. No machine is perfect for everyone so there are also a few things that we think could improve on the Westinghouse iGen 2500. However, these are mostly a matter of convenience and preference. Again, we would prefer an electrical start button instead of a manual recoil system to get the engine running. Also, several users of the Westinghouse iGen 2500 report a faulty push start. We do understand that a push start would add extra weight to the design because then a battery is also needed. So, perhaps improving the manual recoil system for the next generation is a good start. Another common fault in the Westinghouse iGen 2500 is the cap for the fuel tank. Several reviewers have had issues with its fit. Luckily, faults like this are covered for in its warranty which lasts three years. So, in theory you should not have an issue with getting a replacement or repairs done. The Westinghouse iGen 2500 is a great inverter generator option for its class. It delivers above average power while still being as portable as comparable models that hold less power. If the amount of power is the most important factor to you then we recommend the Westinghouse iGen 2500. Plus, you can double up the power by connecting a second inverter generator of the same model. In terms of fuel efficiency and run time, we think the Westinghouse iGen is average. With 7.7 hours on a quarter load and 6 hours on a half load the run time is not out of the ordinary but it is still very decent. In the end, you can only run a generator for so long when the fuel tank only fits 1 gallon. For recreational use, the run time of the Westinghouse iGen 2500 is more than enough. We envision this model as an inverter generator for camping trips. It is easy to carry and easy to hook up, even with a direct connection for USB ports. Our favorite aspect of the Westinghouse iGen 2500 is its LED screen. It offers a complete picture of everything going on with the generator. It is rare to find such a display screen on other inverter generators so this is definitely a plus point. The LED screen proves especially useful for frequent users. Overall, the Westinghouse iGen 2500 is a great inverter generator for recreational use. It power output and LED control panel puts it above the comparable models at a good price.